(If this Solemnity occurs in Holy Week it is Transferred to Mon. after the 1st week of Easter since it cannot replace Holy Week or Easter)The fact of the Annunciation of the Blessed Virgin Mary is related in Luke 1:26-38. The Evangelist tells us that in the sixth month after the conception of St. John the Baptist by Elizabeth, the angel Gabriel was sent from God to the Virgin Mary, at Nazareth, a small town in the mountains of Galilee. Mary was of the house of David, and was espoused (i.e. married) to Joseph, of the same royal family. She had, however, not yet entered the household of her spouse, but was still in her mother's house, working, perhaps, over her dowry. (Bardenhewer, Maria Verk., 69). And the angel having taken the figure and the form of man, came into the house and said to her: "Hail, full of grace (to whom is given grace, favoured one), the Lord is with thee." Mary having heard the greeting words did not speak; she was troubled in spirit, since she knew not the angel, nor the cause of his coming, nor the meaning of the salutation. And the angel continued and said: "Fear not, Mary, for thou hast found grace with God. Behold thou shalt conceive in thy womb, and shalt bring forth a son; and thou shalt call his name Jesus. He shall be great, and shall be called the Son of the Most High; and the Lord God shall give unto him the throne of David his father; and he shall reign in the house of Jacob forever. And of his kingdom there shall be no end." The Virgin understood that there was question of the coming Redeemer. But, why should she be elected from amongst women for the splendid dignity of being the mother of the Messiah, having vowed her virginity to God? (St. Augustine). Therefore, not doubting the word of God like Zachary, but filled with fear and astonishment, she said: "How shall this be done, because I know not man?" 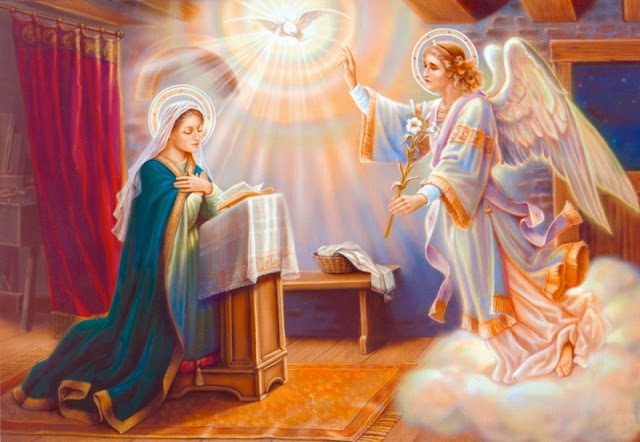 The angel to remove Mary's anxiety and to assure her that her virginity would be spared, answered: "The Holy Ghost shall come upon thee and the power of the Most High shall overshadow thee. And therefore also the Holy which shall be born of thee shall be called the Son of God." In token of the truth of his word he made known to her the conception of St. John, the miraculous pregnancy of her relative now old and sterile: "And behold, thy cousin Elizabeth; she also has conceived a son in her old age, and this is the sixth month with her that is called barren: because no word shall be impossible with God." Mary may not yet have fully understood the meaning of the heavenly message and how the maternity might be reconciled with her vow of virginity, but clinging to the first words of the angel and trusting to the Omnipotence of God she said: "Behold the handmaid of the Lord, be it done to me according to thy word." Since 1889 Holzmann and many Protestant writers have tried to show that the verses Luke 1:34-35, containing the message of conception through the Holy Ghost are interpolated. Usener derives the origin of the "myth" from the heathen hero worship; but Harnack tries to prove that it is of Judaic origin (Isaiah 7:14, Behold a Virgin shall conceive, etc.). Bardenhewer, however, has fully established the authenticity of the text (p. 13). St. Luke may have taken his knowledge of the event from an older account, written in Aramaic or Hebrew. The words: "Blessed art thou among women" (v. 28), are spurious and taken from verse 42, the account of the Visitation. Cardinal Cajetan wanted to understand the words: "because I know not man", not of the future, but only of the past: up to this hour I do not know man. This manifest error, which contradicts the words of the text, has been universally rejected by all Catholic authors. The opinion that Joseph at the time of the Annunciation was an aged widower and Mary twelve or fifteen years of age, is founded only upon apocryphal documents. The local tradition of Nazareth pretends that the angel met Mary and greeted her at the fountain, and when she fled from him in fear, he followed her into the house and there continued his message. (Buhl, Geogr. v. Palaest., 1896.) The year and day of the Annunciation cannot be determined as long as new material does not throw more light on the subject. The present date of the feast (25 March) depends upon the date of the older feast of Christmas. The Annunciation is the beginning of Jesus in His human nature. Through His mother He is a member of the human race. If the virginity of Mary before, during, and after the conception of her Divine Son was always considered part of the deposit of faith, this was done only on account of the historical facts and testimonials. The Incarnation of the Son of God did not in itself necessitate this exception from the laws of nature. Only reasons of expediency are given for it, chiefly, the end of the Incarnation. About to found a new generation of the children of God, The Redeemer does not arrive in the way of earthly generations: the power of the Holy Spirit enters the chaste womb of the Virgin, forming the humanity of Christ. Many holy fathers (Sts. Jerome, Cyril, Ephrem, Augustine) say that the consent of Mary was essential to the redemption. It was the will of God, St. Thomas says (Summa III:30), that the redemption of mankind should depend upon the consent of the Virgin Mary. This does not mean that God in His plans was bound by the will of a creature, and that man would not have been redeemed, if Mary had not consented. It only means that the consent of Mary was foreseen from all eternity, and therefore was received as essential into the design of God.